If you're trying to figure out why some people have high blood pressure, it will do you no good to look only at those who have high blood pressure - you won't be able to tell what they are doing differently from those without high blood pressure! In the same way, when a sample of companies contains only successful companies, how is one able to ascertain what separates the successful from the unsuccessful? One can't. Based on the attributes of these companies, you can basically draw any conclusions you like about what results in success. This is what Rosenzweig calls "connecting the winning dots". 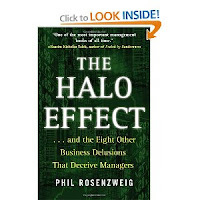 One of the most successful business books of all time, In Search of Excellence, suffers from this very problem, according to Rosenzweig. The authors selected and studied 35 outstanding companies and came up with some common attributes...but how were those attributes distinguished from those of less successful companies? They weren't. In the five years following publication, 30 of the 35 companies that served as the authors' examples had lower profitability, some substantially so.